Below is an updated version of some notes I made in 2016 on Samuel Decanio’s 2014 AJPS article “Democracy, the Market, and the Logic of Social Choice”. Decanio’s paper intriguingly brings together important themes from causal inference and social choice in arguing that market mechanisms should be preferred to elections as means of identifying good ideas. In this post I will leave aside the important question of defining the domain of policy questions that is at issue; we may all agree that the market is better than elections at designing a car (Decanio’s example), but the controversy arises when we ask whether the argument applies to e.g. systems of health care provision. Instead I will focus on how and whether the market really is a better means of generating and refining ideas than politics/elections. My main point is that Decanio presents as a difference in kind what seems to me more to be a difference in scale. A consumer evaluating a product faces many of the same problems as a voter evaluating a party or policy. The consumer has some advantages because her evaluation may benefit from a larger data set, but the nature of her evaluation is the same. To me it seems that almost the whole question is one of scale. Decanio says things are easier in the market because firms don’t have exclusive rights over production. But at a large enough scale, a single party doesn’t have exclusive rights of production over policies: there are multiple polities (countries, states, municipalities) trying different things. It’s not that we cannot attempt to approximate an experiment in evaluating policies, it’s that our evaluations have fewer observations. From the perspective of the entity making the choice (the consumer, or voter), it is also a question of scale and aggregation: there may be multiple houses available whose attributes the consumer can compare, but each consumer basically chooses only one house (which is a bundle of different attributes -location, size, decor) and doesn’t know exactly what would have happened if she had chosen another, though she can visit her friends’ houses. In the political realm the choices apply to collectivities, so all of the voters in each electorate get assigned (and collectively get to choose) one bundle of policies; as with families in houses, they only get one outcome, but they can look at what other families chose and try to infer what would have happened if they chose something else. So I think Decanio’s focus on exclusivity, his characterization of the inferential problems facing voters as being so different from those of consumers in the market, is misguided. The food/diet case: You only get to choose one diet; you don’t know exactly what would have happened if you had chosen something else. You pay attention to how your weight and energy levels covary with different foods and diets, but it’s not easy to infer causal relationships: you’re eating a lot of different things, and there are many things other than diet affecting the same outcomes (e.g. exercise, sleep, stress, disease, relationships with others), and it’s not clear how long each possible effect is likely to take. You get to see what other people are eating, but it’s hard to infer effects because of other (i.e. non-diet) differences between yourself and others. You can try to learn about the effects of diet by looking at scientific studies conducted on observational data; occasionally you get to see a randomized experiment and try to learn from that. The policy case: A collectivity (or a voter in that collectivity) only gets exposed to one policy bundle at a time, and doesn’t know what would have happened if it had chosen something else. The voter can pay attention to how he feels, or how things are generally in the collectivity, and how this covaries with policies that are attempted, but it’s not easy to infer causal relationships: there are many policies that matter for a given outcome (e.g. economic growth), and there are many things other than policies that affect the same outcomes (e.g. technology, culture, events in other polities), and it’s not clear how long each effect is likely to take. You get to see how policies differ in other collectivities, but it’s hard to infer effects because of other (i.e. non-policy) differences between one polity and another. You can look at scientific studies conducted on observational data; occasionally you get to see a randomized experiment and try to learn from that. Decanio makes a lot of the price mechanism in markets and how it is so much more informative than electoral margins. To begin with, I think market share, revenue, or sales volume would be better indicators than price if we’re thinking about firms innovating on products, but the specific metric probably doesn’t matter to the argument. But fundamentally (and especially in a common-values setting) I don’t see much of a difference between a vector of vote shares in a PR system and a vector of market shares in a particular product market (e.g. cars). In both cases, the objects of choice (products/parties) differ on multiple dimensions, so it’s not straightforward to figure out why one is “selling” so much more than another, but the competitors will surely try to figure out why, as will the consumers/voters. Again there may be a difference of degree but I see no difference of kind. Initially I was more convinced by Decanio’s argument that political competition is different from market competition because policy bundles are essentially promises about the future, which require a theory about the state of the world and how policies work, while consumer products are already made, and the effects of the technology can be observed (measured) by the consumer without any specialized knowledge. But on reflection I think the difference is overdrawn. Indeed the consumer can observe some differences among products and choose what she likes without needing a theory about how the firms’ products will end up looking, but this is not true of many important attributes of basically all consumer products (some more than others): reliability, performance, ease of use, suitability for the particular problems the consumer is going to face. The importance of these unverifiable elements is indicated by the willingness of producers to offer guarantees and servicing arrangements and by the existence of publications like Which and Consumer reports, the popularity of websites like Yelp, and the success of Amazon (which includes a huge number of reviews). Warrantees per se don’t exist in politics, but re-election incentives by default play a similar role. When choosing among parties, voters have information about their track record, their promises, their ideology, their leadership. Some things they can evaluate at the time of “purchase”: what the parties have done in the past; what the leaders look like and say. Other things are harder to evaluate: competence; desire and ability to implement the policies proposed. The claim Decanio makes is that the effects of a firm’s technology are observable at time of purchase, but this is not true for parties; in fact some of the effects of the firm’s technology are not observable at time of purchase (e.g. durability) and some of the effects of the party’s technology are (arguably) observable (e.g. the skill of the leaders, the party’s record). In conclusion, I think the inferential problem of choosing the right party to govern (i.e. bundle of policies, plus leaders) is very complicated; for a single voter it has all the same features of the problem of choosing the right diet, except that there are fewer observations and the scope for experimentation is smaller. Perhaps the important differences between decisions made by the market and by elections are not about what information the decision-makers can potentially have, i.e. Decanio’s focus. Rather, the important differences are that market decisions are individual and unanimous (i.e. no one is forced to enter into an agreement) while political decisions necessarily are not. This creates distributional issues (e.g. Buchanan & Tullock), and also incentive problems: why go through all the trouble of getting the information necessary to make a good choice when you are unlikely to be decisive? My conclusion is that we should be less worried about the special difficulty of the problem of choice in politics (Decanio’s focus) than about the lack of incentive to solve it properly (as highlighted in classics by Olson and Downs). On day 2 I got going pretty early, definitely feeling sore from the previous day’s long hike. 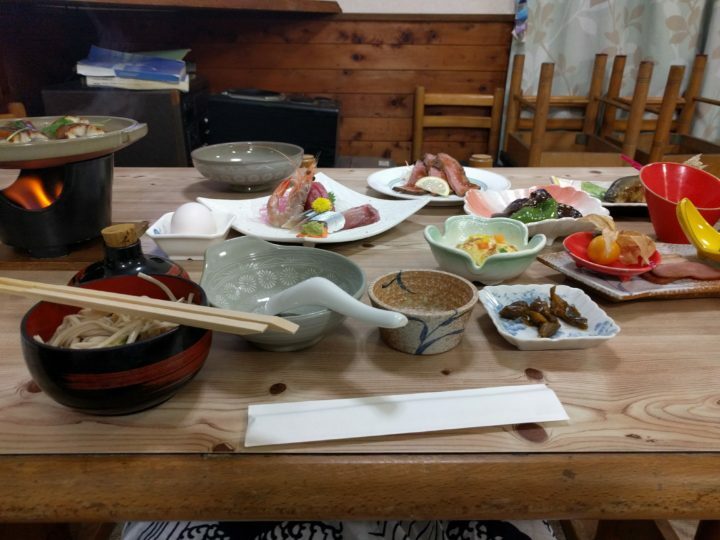 The staff at Kutsurogi no Sato seemed dismayed that I was leaving so early, without having visited the onsen next door — I think we all realized it was a bit silly for me to have visited by myself and made so little use of the facility. I returned to the main road and headed up toward the mountains. The footpath over Usui Pass begins soon after Route 56 splits off from Route 18. The map in the guidebook shows the footpath leaving the road just before a water treatment plant, and thus skipping the big bend in Route 18, but I couldn’t find the path and just stayed on the road. (Soon after, I saw where it is supposed to intersect with Route 18, and it looked to me like the path is no longer maintained here — you should just stick to the road.) The screenshot from Google Street View shows where the footpath starts – there is a shelter, a signboard, and a path marker. Google Street View shot of the footpath’s start. The path starts pretty steep and is pretty well maintained. (The wooden steps in the picture below are useful but will need to be maintained in the next few years.) I was pretty excited to walk on a forest path after a day of walking on asphalt. 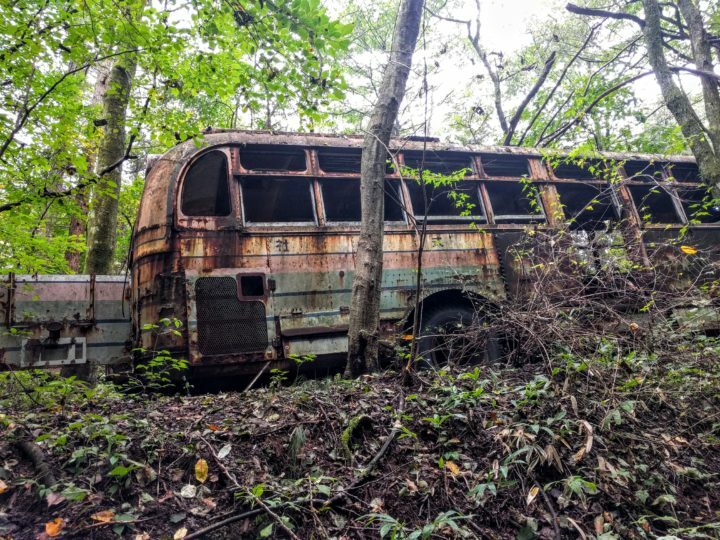 I can only imagine how much more exciting it is if you’ve been walking through the Tokyo outskirts for three or four days. 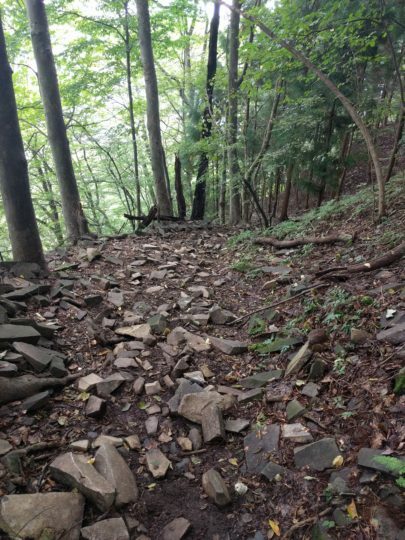 There are also some rocky stretches like the one below that could be a little treacherous in heavy rain, but contrary to how it might look in the picture the path is very clear in this section. It would be pretty impossible to get lost; there are basically no junctions. Still, to be safe it would be good to know the characters for Nakasendo (中山道). 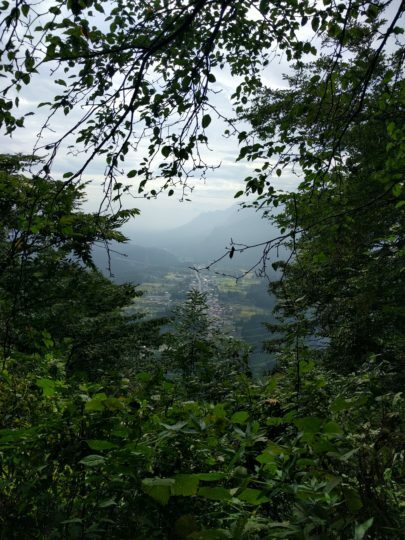 One of the payoffs in this early section is a clear view back toward Takasaki in which you can see the Nakasendo running through the valley (see below). This view is already quite overgrown compared to photos I’ve seen of it on other blogs — make sure to visit soon before it is overgrown completely! Along the way, there are many historical markers like the ones below. They describe historical events that took place along the path, religious statues, and the remains of tea rooms and other travelers’ accommodations that are still visible along the path. The marker below explains that there was a tea house here (actually four, if my reading is correct) and that a stone wall remains (visible in the back of the photo). Plus some graves! After the initial climb the path flattens out and follows a ridge through the forest. This was the nicest part of the whole trip for me. 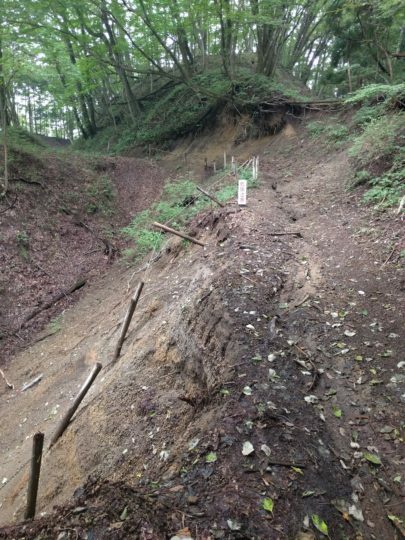 Watch out for erosion! Again some maintenance will be necessary. There is a stretch where the path is sunken and winding, as if in a bobsled run. 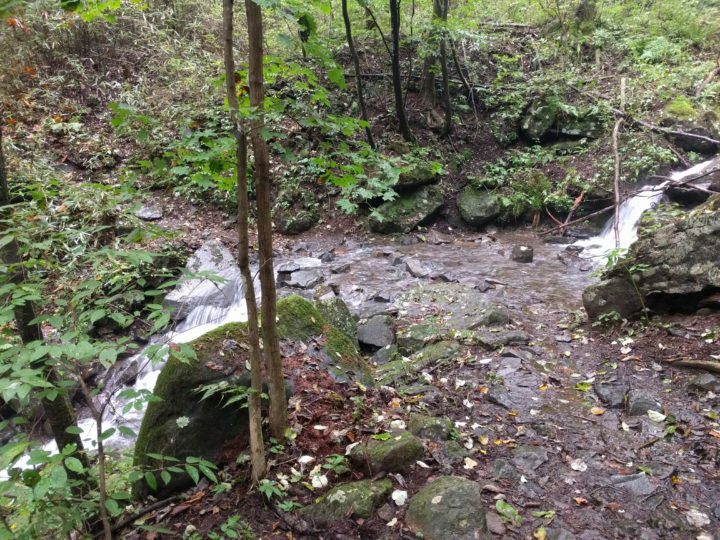 In this section I heard rustling and movement in a stream bed below the path, which I thought might be bears. (I had seen signs about bears, and I knew that some walkers carried bear bells.) Eventually I caught sight of some large animals that I later figured out were not bears but wild boars, or i no shishi. After my initial sighting from a very safe distance I later heard some that were closer to the path; I got a pretty good glimpse (but not a good photo), then clapped my hands, which sent them darting away. At this point I was a little uneasy, as I was walking alone and I didn’t know anything about these animals. I was grateful that it wasn’t raining as I imagine it might get pretty muddy in these trough-paths. As it started to rain slightly, I came across the stream below. I decided to take off my shoes and socks to wade through. To my horror both ankles were bleeding! The blood had soaked through both socks, but I hadn’t noticed because they were covered by my pants. 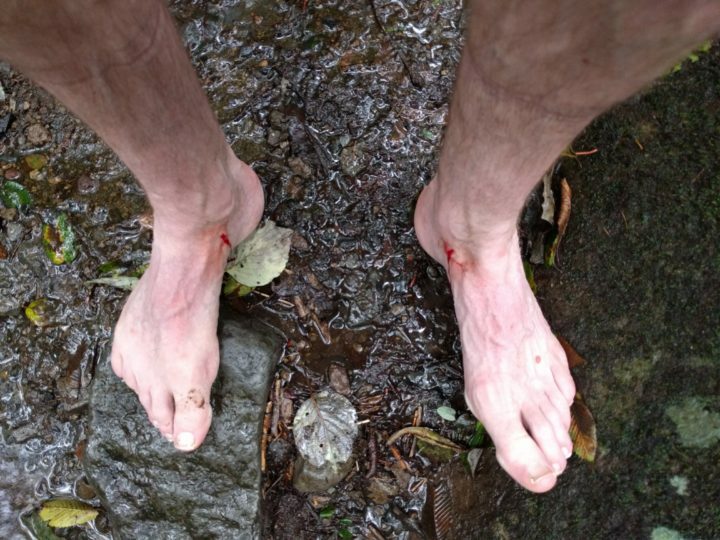 I had little cuts on each ankle in almost precisely the same spot. I thought back to some of the entries I had seen in the guestbook at a shelter earlier in the day, which referred to leeches. Alas somewhere along the path I had been bitten by “mountain leeches” or yamabiru. Very impressive creatures! I would recommend protecting yourself against these in some way — perhaps by wearing boots that lace up above the ankles or wearing gaiters. Along this part of the path there was an intersection that as far as I recall was the only possible point of uncertainty during this stage of the trip. (See below.) The path I had come from was behind me, and two options lay in front of me. 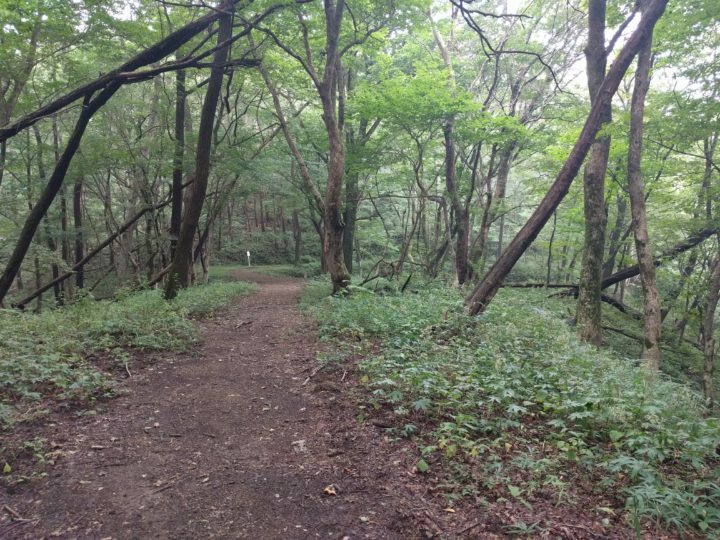 The path on the left is the Nakasendo trail, heading for Karuizawa; the one on the right heads up the mountain (to a historic battle site, if I recall correctly). So if you’re coming from Tokyo, you want to go left here; if coming from Karuizawa just go straight. By this point in my journey it had started to rain more seriously. Just as I started to get soaked, the path turned into an asphalt road and I found myself in front of a shrine and a restaurant/gift shop. This collection of buildings is called Togemachi (literally, Pass Town) on Google Maps. I walked into the restaurant somewhat beleaguered and ordered some udon. From here to the edge of Karuizawa (Ginza Dori) the Nakasendo path is apparently fairly difficult to follow. 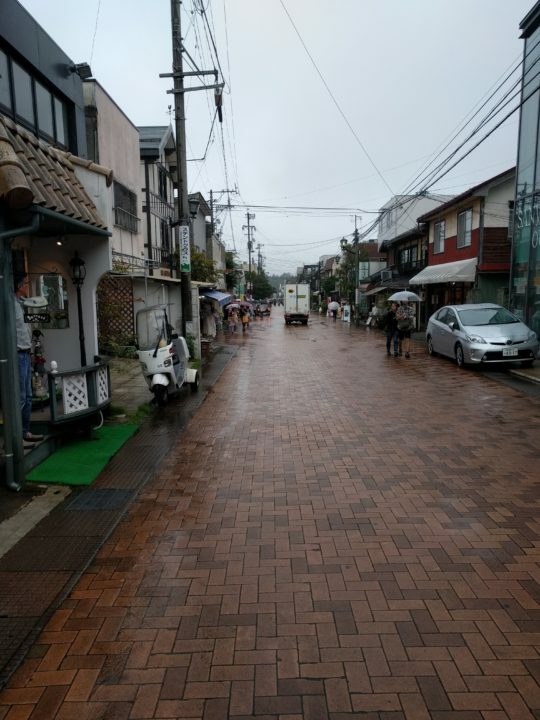 I was told by a guy working at another restaurant/gift shop in the same area that this was actually the hardest part to follow on the whole Nakasendo. He advised that I take the road (Route 123 on the map) instead. I set off to do that with my flimsy umbrella as the rain poured down. Eventually I was overtaken by a guy in a car who offered me a ride. I gratefully accepted. It took me a minute before I realized it was the same guy I had talked to about the path to Karuizawa; he had changed out of his work uniform so I didn’t recognize him at first. He dropped me off at Ginza Dori, where touristy shops line the route of the old Nakasendo. (See below.) 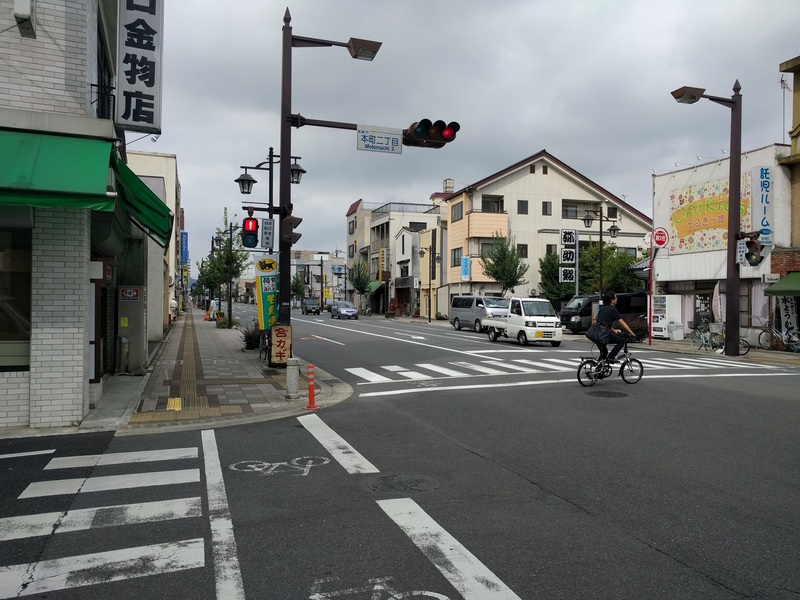 This is a different scene from the towns along the Nakasendo from Takasaki to Yokokawa; Karuizawa is a tourist destination in its own right, not a run-down town whose only claim to significance is its status as a post town on a now-defunct trade route. The more upscale feel intensified as I continued through Karuizawa, walking past expensive-looking private homes and resort hotels. My hotel for the night was on the other end of Karuizawa, in a ryokan called Yuusuge Onsen Ryokan. I arrived late afternoon, had a bath in their very modest onsen, and ate a big dinner in their dining room. Room and dinner shown below. If you’re looking to do this trip, I would not recommend this accommodation either. I saw it compellingly and dismissively described on a Japanese website as “Showa-poi”, meaning that it had the feel of the Showa era, which lasted from the 1920s to the 1980s. 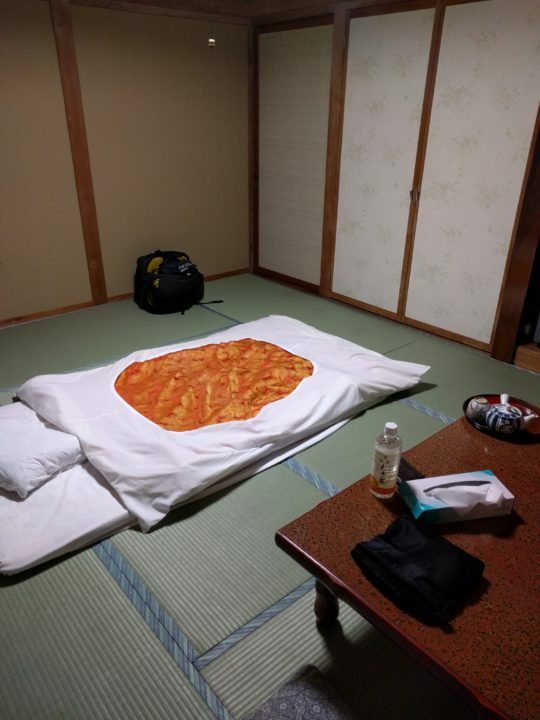 That in itself should not dissuade you, but it smelled of cigarettes in the lobby; the onsen itself was meager; and the window screens in my room were unable to keep out two mosquitos that terrorized me throughout the night. (I know there were two because the harassment didn’t stop until I had killed both.) All this would be fine if it were cheap but it wasn’t. It’s possible that everywhere else in Karuizawa is astronomically expensive (as it appears to be a pretty posh resort town) but I think I could have done better. Takasaki post station, on a construction barrier. The next morning I set out early-ish along the route. My guide for the route, by the way, was this book that I bought from Amazon. There may be a KML or GPX file that one can download that captures the whole route, but I wasn’t able to find it. (My Japanese Google skills may not have been sufficient.) I used the book to create a partial route on Google Maps on my laptop, which I then could view on my phone along the route. (I’ll see about making that publicly available.) It would be challenging for someone who can’t read Japanese to use the book alone, as none of the place names are written in Roman characters, but I suppose if you were in a place and could find the corresponding map, you could look back and forth between google maps and the book to locate the route. 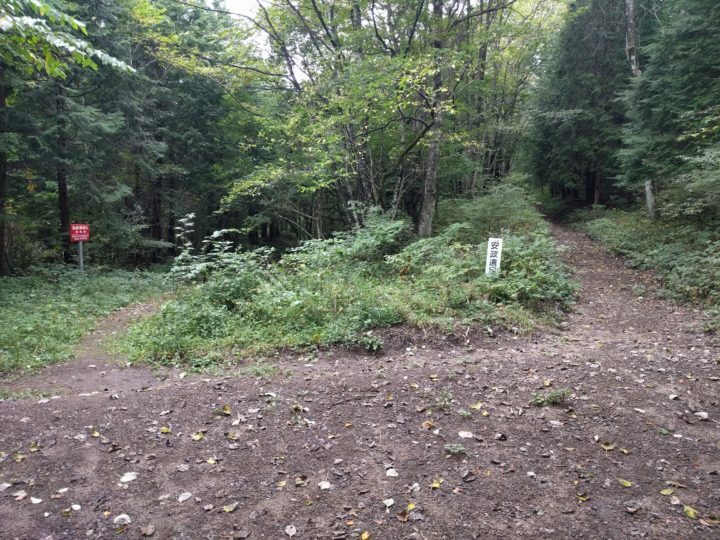 Obviously someone should just make the whole route available as a GPX file — wouldn’t be that hard. Screenshot of my Google Map. On the road out of Takasaki. 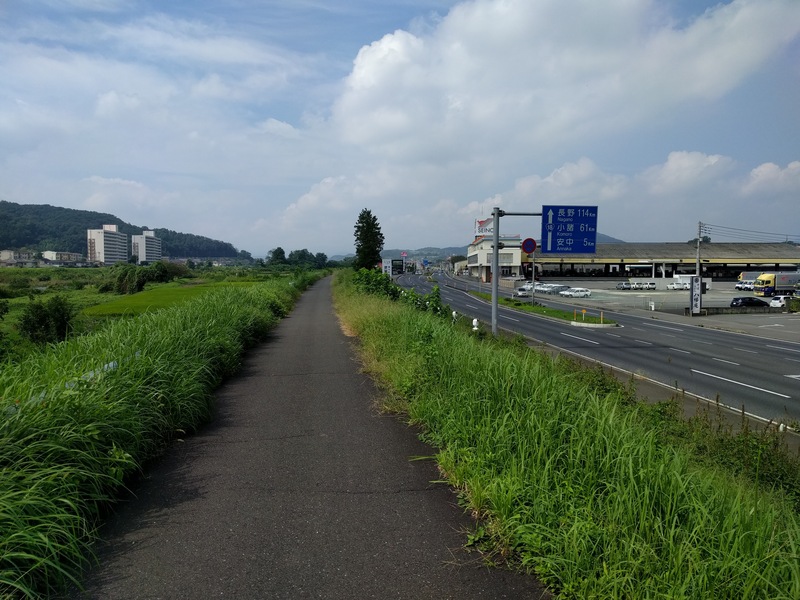 The walk out of Takasaki was basically pleasant: there is one stretch where the route takes you along Route 18 that looked kind of unappealing, so I walked on an asphalt path closer to the river (see photo below); I don’t think I missed much. River to the left, Route 18 (and old Nakasendo, apparently) to the right. Mountains ahead, Takasaki behind. 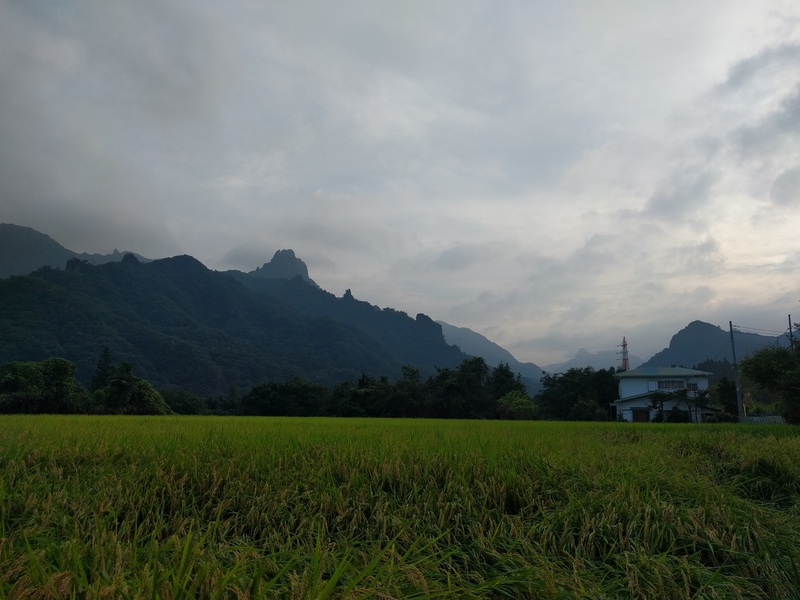 As I walked along the environment became more and more green and the mountains started looming larger; the setting becomes progressively less urban and more rural throughout the day. 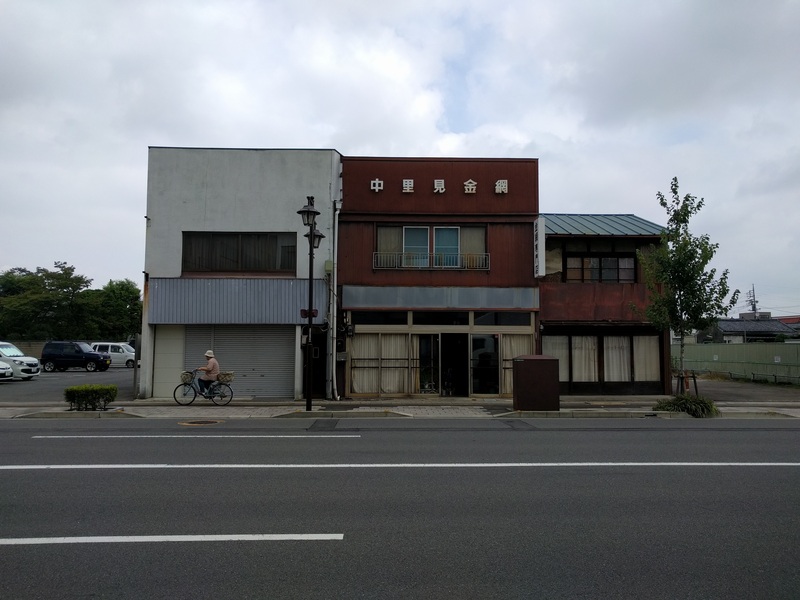 Also, as I got further from Takasaki the towns became quieter and more run down, but certainly not in an unpleasant way. I saw a lot of old people and a lot of shops that seemed unlikely to sell much; there were a lot of formerly grand-looking buildings that were deserted, decaying and falling apart. These towns are quite proud of their heritage as Nakasendo post towns; I frequently saw information billboards explaining the role of the post-town or describing events that happened nearby in connection to the road. This heritage seemed to be their strongest selling point to outsiders. There are also quite a few temples and shrines along the way, and I suppose that they catered in part to passing travelers. An abandoned house near Yokokawa. Around mid-morning I found myself walking behind a man roughly in his 60s who was clearly doing the same walk I was. I eventually caught up to him and struck up a conversation. We ended up having a nice time walking together. 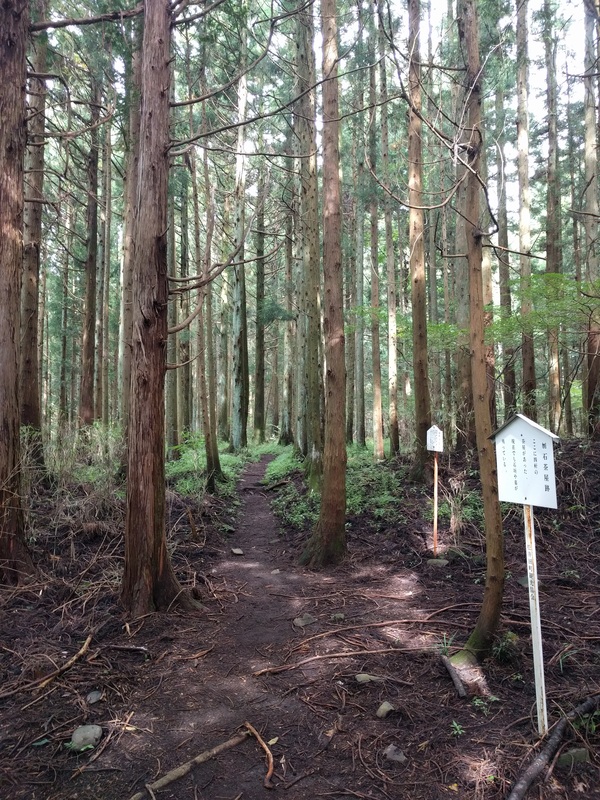 Fujii-san is a retired chemical engineer who lives in Chiba and is walking the Nakasendo in stages; this was a day walk for him, with about three hours of train on either side. 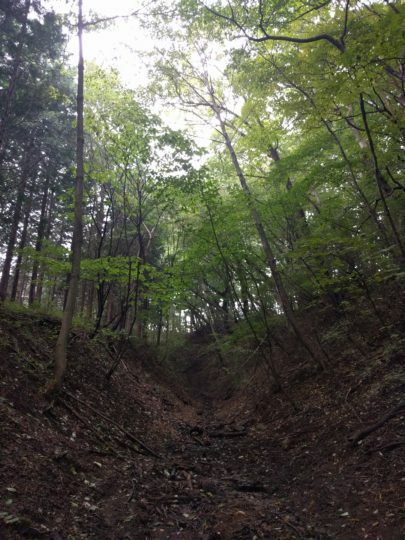 (From this point onward he planned to do the walk in two- or three-day trips, with his wife alongside — the walk from Nihonbashi in Tokyo to the mountains did not interest her, for understandable reasons!) We talked about a range of things, but eventually got around to talking about American politics; as we were walking, Donald Trump and Hillary Clinton were concluding their first debate, and during our lunch break on the steps of a temple we checked on his tablet to see how it had gone. Later in the day Fujii-san started to tire out, and he sent me ahead so he could go a bit slower to his train. We took the selfie below (and I learned the Japanese word for it: jidori) just before parting. As I got further into the mountains and entered the post-town of Sakamoto I was surprised to see some monkeys in a garden. I leaned in to take the picture below (note monkey on the edge of the roof), after which the homeowner came out of her back door with some firecrackers to scare away the monkeys, who seemed to having a meal in her fruit trees. In planning this trip I had some trouble figuring out where to stay at the end of the first day. I think there are some nice places in the mountains that are not near the route, and I thought about doing this and arranging a pickup in Sakamoto. 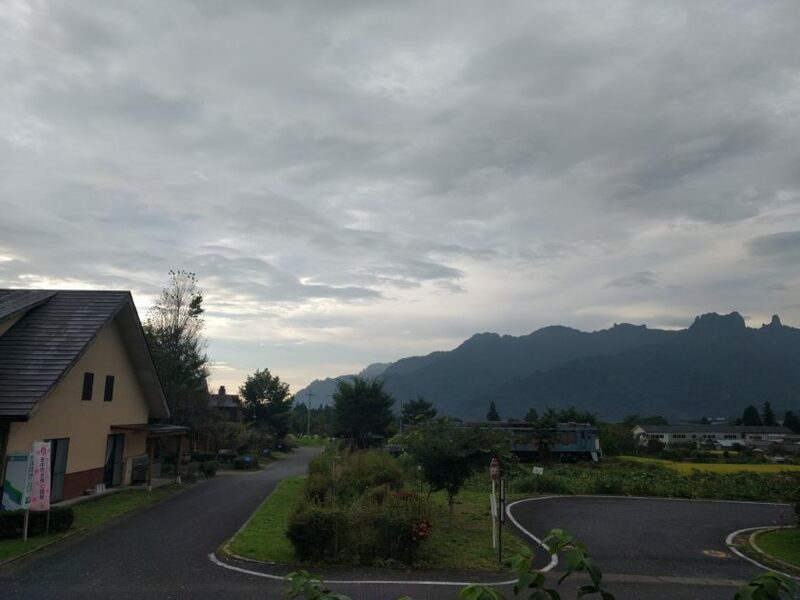 There are a bunch of business hotels around Annaka, but that is not really far enough into the mountains to be interesting. (You could take the train back from Yokokawa to Annaka to stay overnight, but I don’t like to backtrack and get into the hassle of a train.) 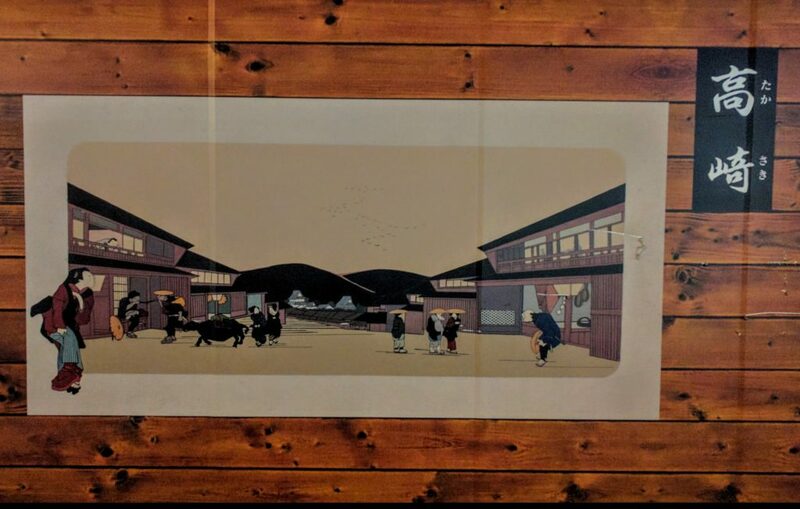 I ended up staying in a “cottage” at an establishment called Kutsurogi no Sato. At the bottom left of the picture below you can see the reception building for this set of cottages; there are six or seven of them scattered around behind it. 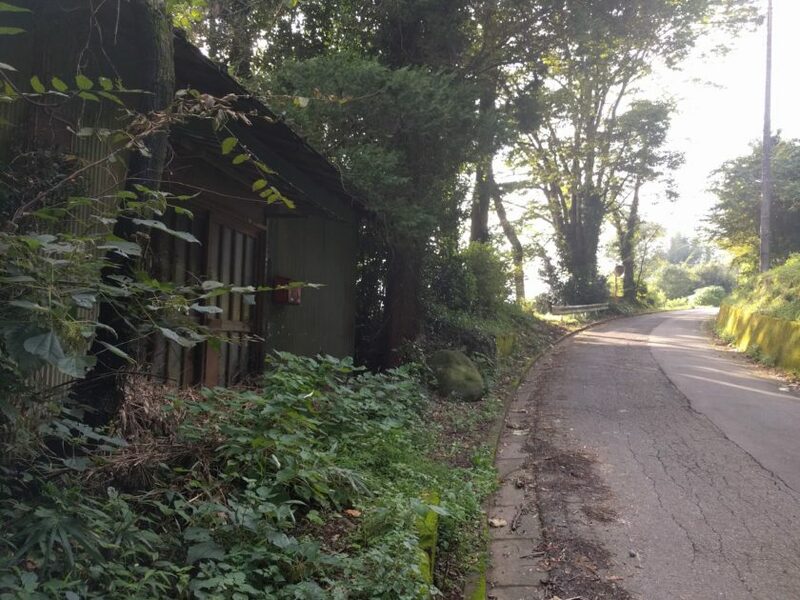 It didn’t really make much sense to stay there by myself because the smallest cottage has four beds, and they are meant to be self-catering, but I was making arrangements kind of last-minute and I didn’t want to deal with the hassle of arranging a pick-up. I think it would make a lot of sense for a group of people doing this walk as a weekend outing from Tokyo to stay at this place. You do need to bring your food (there does not seem to be a restaurant in walking distance); with advance notice they can provide the materials for a BBQ. I brought some ready-made stuff from 7-11, which was not gourmet or anything, but it got the job done. The best part is that it’s close to the walk, next door to an onsen (though it was closed the day I stayed there), and has a beautiful view. The view from Kutsurogi no Sato (in Sakamoto). The building on the left is the reception; behind that are the cottages. 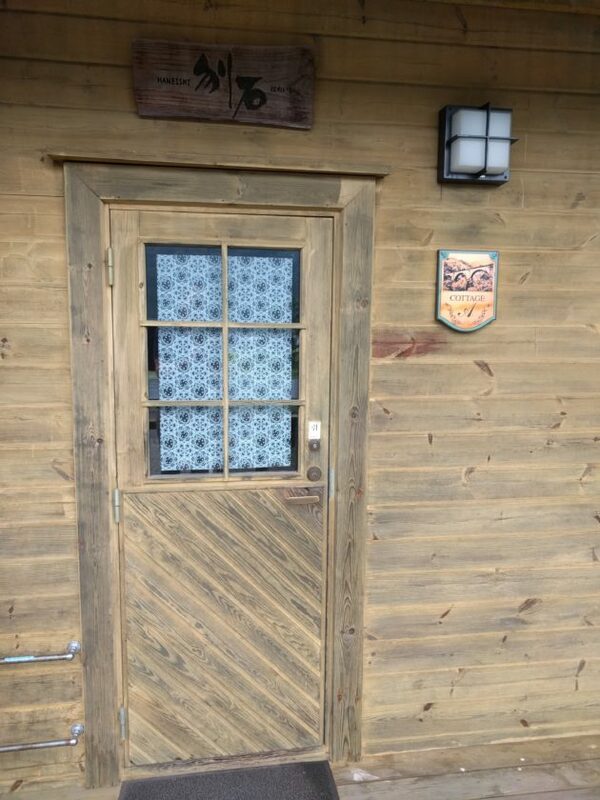 The door of my cottage at Kutsurogi no Sato. 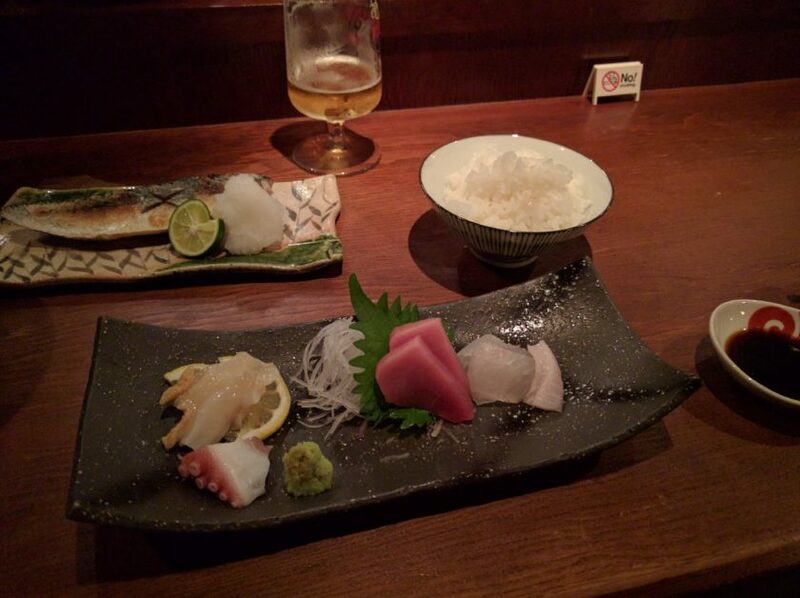 I recently spent 10 days in Japan, mostly to visit old friends in Tokyo and Kanazawa. (I also gave a talk at the University of Tokyo.) 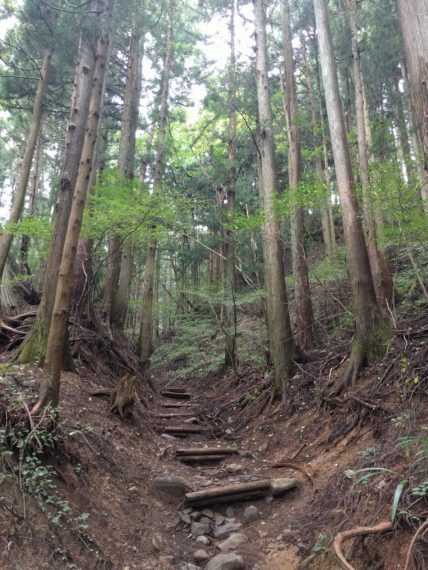 I took the opportunity to do some walking on the Nakasendo, which is one of the two roads established in the early 17th century to connect Tokyo (Edo) and Kyoto. I spent a lot of time before my trip trying to figure out how to fit this in, and I wanted to share some of my experiences here partly as an aid to anyone else who is thinking about doing a short trip on the Nakasendo. 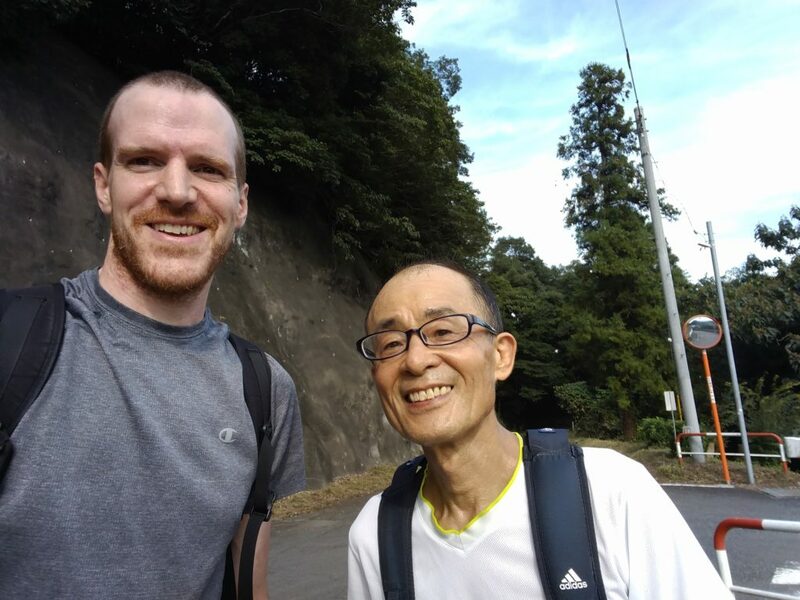 I was able to find some useful blogs describing journeys from Tokyo to Kyoto (or vice versa), such as this guy who did the whole thing in two weeks, this guy from New Zealand who did it over a more reasonable three weeks, and this guy who has great GPS data on the various stages. 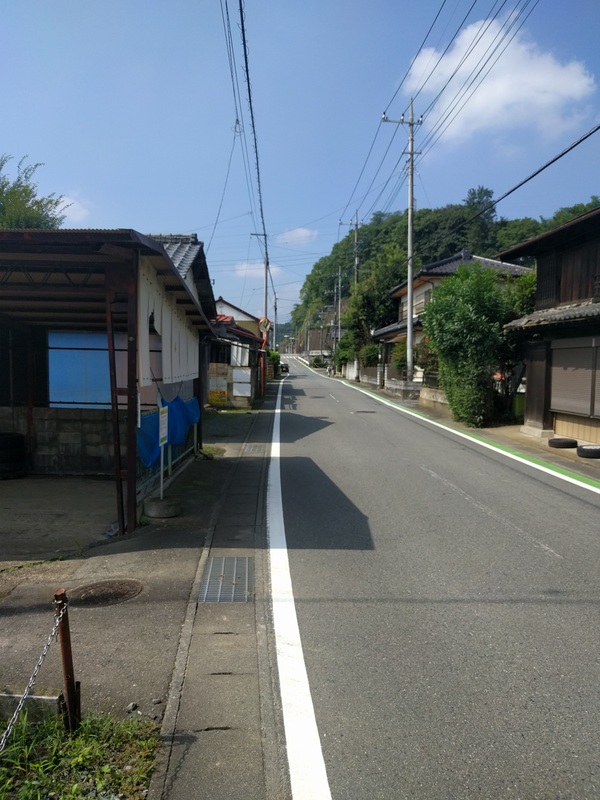 The insane do-it-in-two-weeks guy also has a short but useful post for people considering a shorter trip, basically saying that the Kiso Valley is the best part. 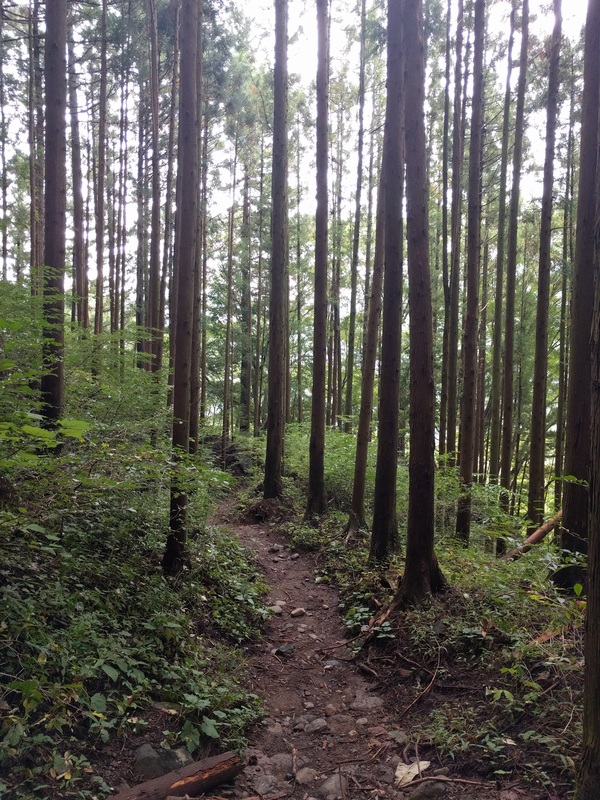 In addition to telling my friends about my trip, I hope that these blog posts might help someone in the future to plan a short excursion to walk the Nakasendo around Karuizawa, which I think is another excellent trip for someone interested in walking and history who has a few days. 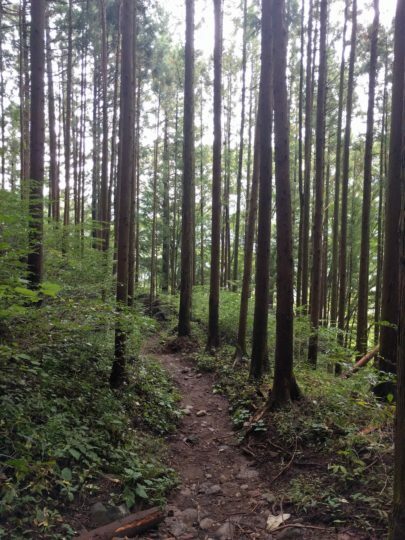 A lovely wooded section of the path in the Usui Pass. 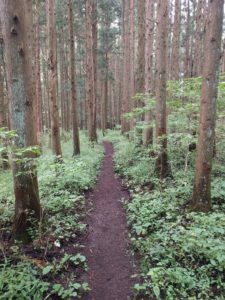 Initially I had thought about spending four days walking; I would arrive somewhere from Tokyo, walk for several days, and then continue on to Kanazawa. I developed a plan for going to the Kiso Valley, which everyone seems to agree is the most scenic part of the Nakasendo. 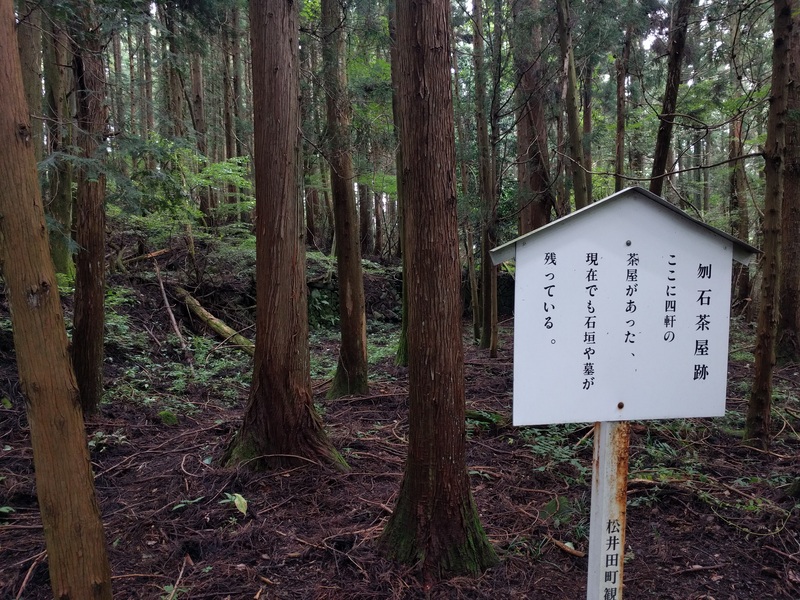 (In fact, in some places I found the section involving Tsumago and Magome described as the Nakasendo, ignoring the rest of the route.) My plan roughly was to take a train to Kani one evening (via Nagoya), stay there overnight, walk to the Daikokuya Ryokan (described in the Walking Fool blog), then to Nakatsugawa, then to Minshuku Koiji in Okuwa (described favorably in the Walking Fool blog), and then maybe as far as Kiso-Fukushima before taking a train to Shiojiri and onward through Nagano to Kanazawa. As it turned out, I ended up with really only two and a half days for walking, so I started to explore an alternative approach that would require less transit time. The plan I actually implemented was to take the train from Tokyo to Takasaki and walk from there to Sakudaira, stopping overnight in Sakamoto and west Karuizawa. This definitely minimized my transit hassle — basically it was shinkansen to Takasaki and shinkansen from Sakudaira to Kanazawa (with a change at Nagano). So it was perfect for my particular constraints. This also makes it a nice itinerary for an outing from Tokyo: you could walk from Annaka to Karuizawa in a very pleasant two days, with one overnight in Sakamoto, or add another overnight and train back from Sakudaira. In the next posts I’ll describe my walk in more detail, but let me just quickly say a bit more about what I think would be a good weekend outing from Tokyo: Leave Tokyo by train early on day 1 to arrive in Takasaki; from Tokyo Station it takes about an hour. 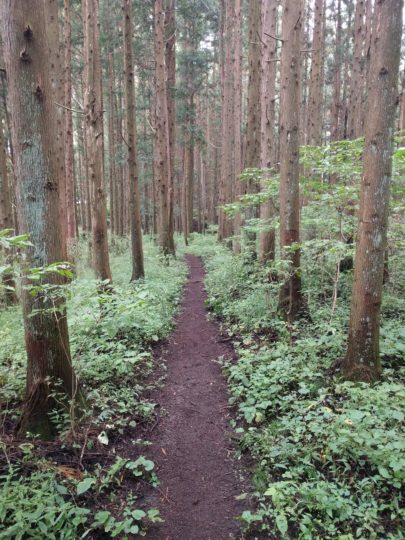 If you are up for 20 miles of walking in a day, walk from there; for an easier day, transfer to the Shin-etsu line to Annaka and walk from there. Stay at Kutsurogi no Sato in Sakamoto if you have a group of 3 or 4 people; otherwise you might want to arrange a pickup near Yokokawa station or train back to Annaka to stay overnight there. On day 2, walk through the mountains over the Usui Pass, arriving at Karuizawa Shinkansen station early afternoon for a train back to Tokyo (with time to do touristy things in Karuizawa or climb up Hanareyama if you’re up for it). Or, for a three day journey, continue on and stay somewhere between Naka-Karuizawa and Oiwake (I stayed at Yuusuge Onsen Ryokan but I wouldn’t recommend it) and walk to Sakudaira Shinkansen station the next day, for a train back to Tokyo. This itinerary does involve some ordinary road-side walking; it is not unremittingly picturesque. And I also prioritized transit simplicity over other goals. But it also involves some lovely paths in the mountains, lots of historical interest, and plenty of places you won’t see on the usual tourist itinerary. 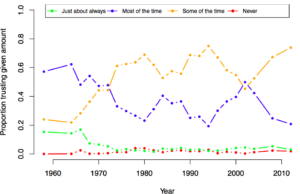 The figure documents changes over time in ANES respondents’ answers to a question about how often they “can trust the government in Washington to do what is right”. Basically the story seems to be that there are two periods: a high-trust period before Vietnam War and Watergate and a low-trust period afterward: before the late 1960s almost two thirds of respondents said they trust the federal government “most of the time” (and about one in six said they trust the federal government “just about always”); from the mid-1970s we have about 2/3 saying they trust the government “some of the time” and 1/3 saying “most of the time”. Recent peaks and troughs (judging by the proportion saying “most of the time”) roughly track the business cycle, though the Iraq War probably contributed to the large drop between 2002 and 2006. Why only one treatment at a time? I remember learning in Gary King’s Gov 2001 class back in the fall of 2004 (!) that we should really only ask about the effect of one cause at a time. That is, having run our analysis we should not expect to be able to infer the effect of more than one variable from it. I remember not really seeing why this was the case: why can’t we run a regression and learn about the effect of more than one of the variables? I thought I would record here some of my current thoughts on this question. Let me start by noting that we can infer the effects of more than one cause at a time given the right dataset. Suppose we have run a conjoint experiment, i.e. we have conducted a survey in which respondents are asked to compare or evaluate items (political candidates, products, reform proposals) whose attributes are jointly randomly varied. (So, one respondent is asked to choose her preferred candidate between a young female banker and a middle-aged female teacher; another is asked to choose between a young female lawyer and an old male banker; etc.) Given this data, we can run a regression of the outcome (the respondents’ choices) on the attributes they were shown, and the coefficients on the attributes will tell us the effect of each treatment averaged over the joint distribution of the other treatments. (We can also estimate interaction effects, but that is more in the spirit of “subgroup analysis” in designs that are focused on only one treatment.) The randomization of a given attribute makes it possible to straightforwardly measure the effect of that attribute; it shouldn’t be surprising that we can randomize more than one attribute at once and thus simultaneously measure more than one effect at once. In some very lucky circumstances we could also use standard methods of design-based inference to simultaneously measure the effect of more than one treatment in observational data. You could have an RDD where treatment A depends on whether the forcing variable is above threshold Z1 and treatment B depends on whether the same forcing variable (or another forcing variable) is above threshold Z2; one could use this situation to measure the effect of both A and B, where each effect is conditional on the value of the other treatment at the relevant cutoff. As with the conjoint experiment, you could of course study these effects totally separately, though combining the analysis may make it more efficient. Actually, we can simultaneously get unbiased estimates of the effects of multiple treatments in any situation where each treatment is a function of a set of covariates X (but not the other treatments) and we can do covariate adjustment for X. This could mean a regression that includes all of the treatments and X (with the proper functional form assumptions); we could also create matched groups for each combination of treatments and measure effects by averaging across groups. Where the treatments are conditionally independent of each other and determined only by observable covariates, then for each of the treatments we can say that the value of the treatment is independent of the potential outcomes (which Angrist & Pischke call the conditional independence assumption, or CIA) and thus the effects can all be estimated in one regression. So clearly “one treatment at a time” is not an epistemological law. Why might it still be a good guide? The key point is that although there are circumstances where the CIA is met for more than one treatment at a time (as illustrated above), these circumstances are not common. The more typical situation in observational studies is that the treatments affect each other in some way. When that is the case (for example when treatment T1 affects treatment T2), we must choose a treatment. Why? To estimate the effect of T2, we need to include T1 in the regression unless we have reason to think that T1 has no effect on the outcome (in which case we don’t really care about estimating the two treatment effects anyway). To estimate T1, however, we don’t want to include T2 in the regression because it is “post-treatment” and thus a “bad control” in Angrist & Pischke’s terms. Because T1 affects T2, estimating the effect of T1 precludes estimating the effect of T2; we must choose one of the two effects to estimate. I think post-treatment bias is probably the context in which Gary King was talking about the “one treatment at a time” rule in 2004, because he was thinking about post-treatment bias around that time. (I’d like to go back and look at that work.) It occurs to me now that the causal ordering rationale for the “one treatment at a time” rule also has a useful connection to the literature on mediation effects by e.g. Kosuke Imai that I would like to flesh out at some point. Let me restate all of this a bit differently (and a bit more succinctly): We can estimate the effects of a treatment whenever the conditional independence assumption (CIA) is met, but outside of conjoint experiments it is unusual for the CIA to be simultaneously met for more than one treatment. Fundamentally this is because the world is complicated and the treatments we’re interested in typically affect each other. In these situations we might be able to estimate the effects of the various treatments of interest. (It depends on the plausibility of the conditional independence assumption in each case.) But the design will need to be different for each treatment. The first response to someone asking this question is that I’m telling you about experiments not just because it would be nice if you did one, but also because thinking about experiments helps you understand the challenges we face in observational studies. For any causal research question, it’s always good to ask what the ideal experiment would be; in design-based observational studies, you follow that up by saying why the ideal experiment is impossible and why the design you’ve chosen is a good approximation. But I also want to address the practical question: how can you do an experiment when you don’t have a huge grant? The answer I gave in last week’s lecture is that you can cultivate a relationship with a party organization, or NGO, or government agency, and offer a free evaluation if they are willing to work with you on design. Of course this depends on some luck and possibly some connections, but it’s important to remember that you might be offering something that they would otherwise have to pay a lot of money for. Graduate students are usually poor in money, but rich in another resource: time. How much of what a senior researcher would usually pay for can you do yourself, or in collaboration with other students? Not all field experiments need to be expensive: Think for instance of the many audit experiments conducted with legislators by Butler/Broockman etc. If you have a great idea, but lack funding (and a bit of know-how), it might be worth asking a faculty member (this can, but need not be your supervisor) if they would be interested in collaborating on an experiment. Think about what type of outcome you are interested in: Some behavioural outcomes can be collected without expensive post-treatment surveys. Administrative data is usually free of charge or available from government agencies for a small charge. Also, you could always fake the outcome data. I finally got around to reading Milton Friedman’s classic Capitalism and Freedom. After spending time this summer reading Adam Swift’s Political Philosophy: A Beginner’s Guide, which IIRC recommends Friedman’s discussion of equality, I find Friedman to be unimpressive as a work of political philosophy, but this is partly for two reasons that are not his fault. First, part of why I found the book unimpressive is that the ideas are so familiar to me. When I first heard the Beatles I thought they sounded just like everyone else; it took me a while to figure out that this was partly because so many others had copied them. Similarly, Friedman’s ideas have been recycled so much — not just in economics departments but in political discourse, mainly from the right — that they hardly seem revolutionary anymore. Relatedly, what he is doing is applying basic economic analysis to questions of political philosophy. Until recently this was the only kind of political philosophy I had ever really engaged in: explaining the efficiency losses associated with government intervention, identifying market failures that justify government intervention, etc. The core ideas about the proper role of government in this book are applications of standard economic theory, with a healthy portion of enthusiasm about freedom thrown in. Our principles offer no hard and fast line how far it is appropriate to use government to accomplish jointly what it is difficult or impossible to us to accomplish separately through strictly voluntary exchange. In any particular case of proposed intervention, we must make up a balance sheet, listing separately the advantages and disadvantages. Our principles tell us what items to put on one side and what items on the other and they give us some basis for attaching importance to the different items. Thus in discussing natural monopolies, he admits we are “choosing among evils” (public monopoly, public regulation, or private monopoly) and provides some thoughts on which might be less evil (hint: often it’s private monopoly); in discussing paternalism, he recognizes that the state must restrict freedom to provide for children and the insane, but that after that “there is no formula to tell us where to stop.” This is I think an accurate view of what a commitment to “freedom,” combined with the tools of welfare analysis from microeconomics, yields in terms of policy proposals: not much. That’s not to say that this book stops short of providing lots of policy proposals. In fact, Capitalism and Freedom is much more interesting as a set of provocative policy proposals than a statement of political philosophy. But the key point is that to arrive at these policy proposals you need more than Friedman’s stated commitment to freedom plus standard ideas from microeconomics about the tradeoffs involved in government intervention in markets. Mostly, you need a lot of beliefs about the nature of the social world, e.g. the degree to which high marginal tax rates encourage tax avoidance and evasion. On a superficial reading one can fail to recognize the importance of these beliefs on empirical matters and read this as a coherent work of philosophy in which the policy prescriptions follow from a commitment to freedom and some basic ideas about how markets work. In fact, the interesting ideas in the book (like the claims about how markets tend to disadvantage those who discriminate) are commitments to contestable causal claims just as much as they are embodiments of a high value placed on freedom, or more so. Another way to put this is that policy proposals from left, right, and center (in liberal democracies like the US, UK, France) could be justified on the basis of principles in the first two chapters of Capitalism and Freedom. The same of course can be said for other influential groundings of political philosophy, such as the Rawlsian thought experiment about the original position. Clarifying normative values and even proposing ways for prioritizing among them seems to fail to get us very far toward policy recommendations, because in all important cases there is a large set of empirical facts that stand between principles and policy outcomes. Friedman argues that political freedom requires a market economy because dissent requires resources; in a “socialist” economy (by which he means one in which private property does not exist, or at least where the state controls the means of production), how could one finance a program of political dissent? Where would Marx find his Engels? Like Buchanan and Tullock in The Calculus of Consent (published in the same year — 1962), Friedman has some nice insights into how voluntary economic exchange and government intervention relate. One reason to prefer market activity is that you get “unanimity without conformity,” in the sense that everyone agrees to the outcomes (excluding market failures of course) and you still get a variety of outcomes. Again putting market exchanges in political terms, Friedman portrays market exchange as analogous to proportional representation, in the sense that everyone gets what she votes for, without having to submit to the will of the majority. The chapter on education is a strident case for revising the way in which government supports education. With respect to higher education I find him particularly convincing. The analogy that was relevant when he was writing was the GI Bill, a key feature of which was that the government supported veterans’ education wherever they chose to get it (within an approved list of schools); by contrast, at the university level the individual states support education (particularly of their own residents) only at the public universities in that state. I agree that this does not make a lot of sense, and would favor reform in this area if I didn’t think it would lead to a large reduction in support for education overall. It also made me wonder how much the move toward government loans and grants for education was in response to arguments like these, and to what extent this has replaced public funding for public universities. Friedman makes the case that the voucher system would tend to help economically disadvantaged minorities, in part by unbundling schooling from residential location decisions: a poor single mother who wants to invest in her child’s education may have a better chance under a voucher system, where she could save money and purchase that good like any other, than she does under the current system, in which (assuming that private school is prohibitively expensive) she would have to move the family to an expensive town to benefit from better schools — in other words, buy a whole package of goods in order to get one thing she wants. In the chapter on discrimination, Friedman follows up this discussion of segregation and schooling by highlighting the importance of attitudes of tolerance: In addition to getting the government out of schooling, “we should all of us, insofar as we possibly can, try by behavior and speech to foster the growth of attitudes and opinions that would lead mixed schools to become the rule and segregated schools the rare exception.” In the margin here I wrote “this has happened” — not the part about privatization, but rather that public attitudes have shifted (at least where I live) to where a classroom of white faces is a problem. The avidity with which elite private schools and university pursue diversity suggests that a school system with more choice and competition would not have whiter schools. I somehow doubt however that it would have fewer schools in which almost all students are poor minorities. It makes me want to know more about experiments with school choice. For most of the claims he makes about the virtues of school choice, it would seem that almost everything depends on the way in which you deal with undesirable schools and pupils, and I don’t recall reading anything about that here.